Jacques Cousteau, who was discussed in this chapter, was famous for saying that people protect what they love and that this was what all of his work was about. Here is a short statement to this effect with a call for all those who love the sea to help protect her. Daniel Quinn’s Ishmael is also the name the author took for his website, where more information about Ishmael and Quinn’s other books, including The Story of B, can be found. These books express and have promoted effectively many of the themes common in dark green nature spirituality. It seems to me that in the human supremacist culture of the West there is a strong effort to deny that we humans are also animals positioned in the food chain . . . This concept of human identity positions humans outside and above the food chain, not as part of the feast in a chain of reciprocity but as external manipulators and masters of it. . . The idea of human prey threatens the dualistic vision of human mastery in which we humans manipulate nature from outside, as predators but never prey. We may daily consume other animals by the billions, but we ourselves cannot be food for worms and certainly not meat for crocodiles. This is one reason why we now treat so inhumanely the animals we make our food. Plumwood’s vegetarianism was reinforced by the experience, not because she considered herself morally superior to meat-eating predators but because she objected to factory farms that disrespect animal lives. “Being Prey” was widely assigned in environmental ethics courses, cited by environmental studies scholars, and reproduced in textbooks and anthologies, as for example in David Rothenberg, Marta Ulvaeus, and NetLibrary Inc., The New Earth Reader the Best of Terra Nova (Cambridge, Mass. : MIT Press, 1999). Par, more on Chris Van der Merwe’s safari rites: I was struck with how he was grappling toward a kind of ritualizing even though he had no clear frame of reference for it or a peer group reinforcing such an approach, insofar as I could tell. There have been, of course, many African figures who have had perceptions and sentiments akin to dark green religion, including the South African internationalist and politician, Jan Christiaan Smuts, who coined the term holism, and had his own mystical connection to nature; see Ian S. Maclean, "Smuts, Jan Christiaan (1870-1950)," in Encyclopedia of Religion and Nature. Par. 2, for references exemplifying social and environmentalist critiques of Disney, see Rebecca Self Hill and Joseph G. Champ, "Disney," in Encyclopedia of Religion and Nature, and the references listed in it and my “Disney Worlds at War.” See also Pauline Turner Strong, "Animated Indians: Critique and Contradiction in Commodified Children’s Culture (a Portrayal of Native Americans in Films)," Cultural Anthropology 11, no. 3 (1966), Jennifer Cypher and Eric Higgs, "Colonizing the Imagination: Disney's Wilderness Lodge," in From Virgin Land to Disney World: Nature and Its Discontents in the USA of Yesterday and Today, ed. Bernd Herzogenrath (Amsterdam, Netherlands: Rodopi, 2001), Bernd Herzogenrath, ed., Critical Studies (V. 15): From Virgin Land to Disney World: Nature and Its Discontents in the USA of Yesterday and Today(Amsterdam/New York: Rodopi, 2001), Eric Michael Mazur and Tara K. Koda, "The Happiest Place on Earth: Disney's America and the Commodification of Religion," in God in the Details: American Religion in Popular Culture, ed. Eric Mazur and Kate McCarthy (London & New York: Routledge, 2001). Par 2., more from the source of the quotes from Stephen Schwartz and Russell Means, which was from an anonymous movie review, which described in detail the care Schwartz and his collaborators took, consulting with the Native Americans closest to the historic figure of Pocahontas, in their efforts to accurately capture her culture and its spirituality. The review is no long unavailable at movieweb.com but may have been from the original Pocahhontas Press Kit, which may be available as part of the “Lisa Lu Press Kit collection,” Special Collections of the library at California State University Northridge. Some of the same words by Russell Means were quoted in John Shelton Lawrence and Robert Jewett, The Myth of the American Superhero (Grand Rapids, Mich.: W.B. Eerdmans, 2002), 107; see also James Stripes, "A Strategy of Resistance: The "Actorvism" Of Russell Means from Plymouth Rock to the Disney Studios," Wicazo Sa Review 14, no. 1 (1999), see esp. 88-89. Par. 3, additional reference on The Pocahontas story’s transformation: Roxana Preda, "The Angel in the Ecosystem Revisited: Disney's Pocahontas and Postmodern Ethics," in From Virgin Land to Disney World: Nature and Its Discontents in the USA of Yesterday and Today, ed. Bernd Herzogenrath (Amsterdam, Netherlands: Rodopi, 2001). Par 3., The definition of pansophist was found at pansophist.com but is no longer available there. The discussion suggested that a better term might be the better-known word, pantheism. The term pansophism, however, can be found in the Oxford English Dictionary, as follows: “the possession or profession of universal knowledge.” It is also used in The Encyclopedia Britannica’s online article on John Amos Comenius, the 17th Century Czech educator and philosopher, who said: “pansophy propoundeth to itself so to expand and lay open to the eyes of all the wholeness of things that everything might be pleasurable in itself and necessary for the expanding of the appetite.” See also http://www.yourdictionary.com/pansophism. I am indebted to Bernard Zaleha for these references. Par. 2, for bricolage and the integration of Tolkien’s novels in nature spirituality, see Bron Taylor, "Diggers, Wolves, Ents, Elves and Expanding Universes: Bricolage, Religion, and Violence from Earth First! And the Earth Liberation Front to the Antiglobalization Resistance," in The Cultic Milieu: Oppositional Subcultures in an Age of Globalization, ed. Jeffrey Kaplan and Heléne Lööw (Lanham, Maryland: Altamira/Rowman and Littlefield, 2002). Tolkien’s story was first published in 1954 and 1955, republished and repeatedly translated after that, and its global reach was enhanced with the film versions directed and produced by Peter Jackson between 2001 and 2003, which won a total of 17 Academy awards. For details see “The Lord of the Rings Film Trilogy” in Wikipedia, at http://en.wikipedia.org/wiki/The_Lord_of_the_Rings_film_trilogy. Par. 3, some forms of Pantheism clearly fit what I am calling dark green religion, and like dark green religion, some of it is strictly naturalistic while other forms are not. Although Robert Corrington maintains that his own perspective is entirely naturalistic, by endorsing Vedic notions of reincarnation and the eternal nature of the soul he maintains a non-material dimension to his understandings such that would locate him as promoting Gaian Spirituality more than a “pure” Gaian Naturalism. Another professing Pantheist who does seem entirely in the naturalistic camp is Donald Crosby. For his book and a subsequent and illuminating dialogue with Corrington see Donald A. Crosby, A Religion of Nature (Albany, New York: State University of New York Press, 2002), Robert S. Corrington, "Deep Pantheism," Journal for the Study of Religion, Nature and Culture 1, no. 4 (2007), Donald Crosby, "A Case for Religion of Nature," Journal for the Study of Religion, Nature and Culture1, no. 4 (2007), Donald Crosby, "Further Contributions to the Dialogue," Journal for the Study of Religion, Nature and Culture1, no. 4 (2007). For an excellent thesis exploring in more depth than I could in Dark Green Religion a number of thinkers discussed in this volume, which also argued that such religiosity is growing in importance as a religious alternative, see Daniel Bernard Zaleha, "The Only Paradise We Ever Need: An Investigation into Pantheism's Sacred Geography in the Writings of Edward Abbey, Thomas Berry, and Matthew Fox, and a Preliminary Survey of Signs of Emerging Pantheism in American Culture" (University of Florida, 2008). Par., 4, more on Attenborough’s critique of agricultural and its religions in First Eden:Episode 2, for example, was titled “The Gods Enslaved” and in the concluding narration to it Attenborough opined, “It used to be said, that in places like this, nature eventually failed to support man, the truth is exactly the reverse, here man failed to support nature. Ten thousand years ago man regarded the natural world as divine, but as he domesticated animals and plants so nature lost some of its mystery and appeared to be little more than a larder that could be raided with impunity.” And episode 4, “Strangers in the Garden,” concluded with a similar analysis: “It was in the lands around this sea, that some 10,000 years ago, human beings first discovered how to tame animals and cultivate plants. Could it be here too that they also first learned from the mistakes they made during that process, that nations no matter what their political philosophy or economic circumstances or religious beliefs recognize that they simply had to get together and agree, if they were to save these wild landscapes and the animals and plants that live in them. That perhaps, is just one more lesson that the Mediterranean could offer to the world. For surely these things are among our most precious possessions, the last glimpses we have of mankind’s first Eden.” From “The First Eden,” Wikipedia, http://en.wikipedia.org/wiki/The_First_Eden. Par. 4, Attenborough’s The Life of Mammals (2002 - 2003) was developed with Discovery Communications and it was shown on Animal Planet, extending its reach. This ten-part series as well as the corresponding book ended with a call for population control: “Three and a half million years separate the individual who left these footprints in the sands of Africa from the one who left them on the moon. A mere blink in the eye of evolution. Using his burgeoning intelligence, this most successful of all mammals has exploited the environment to produce food for an ever-increasing population. In spite of disasters when civilisations have over-reached themselves, that process has continued, indeed accelerated, even today. Now mankind is looking for food, not just on this planet but on others. Perhaps the time has now come to put that process into reverse. Instead of controlling the environment for the benefit of the population, perhaps it's time we control the population to allow the survival of the environment.” David Attenborough, The Life of Mammals (Princeton, New Jersey: Princeton University Press, 2002). See also the “Life With Mammals” Wikipedia entry at http://en.wikipedia.org/wiki/The_Life_of_Mammals. Par. 2, Steve Irwin’s intense desire to draw close to nature reminds me of Thoreau’s earnest desire for “Contact!, Contact!” when on Mt. Katahdin; see the section “Ambivalence, Enigma and Bricolage” in Dark Green Religion, Appendix A, 245-47, or Henry David Thoreau, Henry David Thoreau: A Week on the Concord and Merrimack Rivers; Walden, or Life in the Woods; the Maine Woods; Cape Cod, vol. Library of America/Penguin USA (New York, 1985), 645-46. Par. 4, more on systems ecologist H.T. Odum: Among other things, Odum’s work explored energy transfers in ecological-cultural-technological systems. While his writings would be obtuse to most non-scientists, Odum worked into his analysis of ecological/energy systems provocative reflections on the role of religion and other symbol systems in ecological systems. Shortly before his death, for example, Odum and his wife/collaborator Elizabeth Odum published an important book summarizing his life-work and how it could contribute to the quest for environmentally sustainable societies. They wrote, “People can place the window of their attention on any part of our interconnected universe, using symbols to define a simplified view of one or more scales of time and space. Such subsystems have common designs that come from their self-organizing toward maximum performance.” See Howard T. Odum and Elisabeth C. Odum, A Prosperous Way Down: Principles and Policies (Boulder, Colorado: University of Colorado Press, 2001), 75. This hinted at the possible role of religious symbol systems in facilitating the self-organization of human-engaged ecosystems in a sustainable direction. If still somewhat obliquely, they made this clearer in the book’s final paragraphs, some of H.T.’s last words, which included provocative reflections about how environmental knowledge in the past “became sacred, and human culture was programmed to become keepers of past knowledge” (p. 286), including regarding the best ways to integrate human energies with the rest of the earth’s, interrelated energy systems, to enhance the well being of all living things. (Here I am again paraphrasing but I think I am doing so in a way that is consistent with their views.) The book made many policy prescriptions including urging a dramatic (and humane) reduction of human numbers, and ended optimistically suggesting that ecological restoration and new ethics (perhaps even with religious or “ritualistic” dimensions), will emerge to facilitate the transformation: “If the Earth is to maximize its performance through the full cycle, a human culture will be needed that helps environmental restoration. We may expect ethics to develop in which people collectively aid net production processes that restore the resource reserves, the soils, the forests, the peat deposits, the mineral deposits moving slowly up from below ground in the Earth cycles. As sometimes attributed to past cultures, people may find glory in being an agent of the Earth. It remains to be seen whether the social mechanisms will be conscious, logical, emotional, ritualistic, regimented, or by some means that we can’t imagine” (286). See also Howard T. Odum, Environment, Power, and Society (New York: Wiley-Interscience, 1971), and Frank Benjamin Golley, A History of the Ecosystem Concept in Ecology (New Haven & London: Yale University Press, 1993), esp. 61-108. Par. 2, a brief history of the wildlands project can be found at http://www.wildlandsproject.org:80/cms/page1127.cfm. Oddly, even though he was no longer formally involved, nowhere on the site was Foreman’s founding role mentioned, although an aphorism well known to environmentalists, penned by Edward Abbey, was prominently featured, “It is not enough to understand the natural world: the point is to defend and preserve it.” For an overview of the project by a scientist who served as one of its Executive Directors in the 1990s see Steve Gatewood, "The Wildlands Project: The Yellowstone to Yukon Conservation Initiative and Sky Islands Wildlands Network," Environments 27 (2000). See also http://www.y2y.net/ for a link to the Y-2-Y partner group, which has many overlapping personnel with the mother organization. The activists and scientists involved with these groups represent a “whose-who” of those involved in1980s-era Earth First! campaigns but they also have many prominent scientists and environmentalists from mainstream environmental groups listed either as advisors, board members, or endorsers, including E. O. Wilson and Paul Ehrlich. Par. 3, more on Thomas Berry’s influence on Suzuki is seen in the opening epigraph of The Sacred Balance: “It’s all a question of story. We are in trouble just now because we do not have a good story. We are in between stories. The old story, the account of how we fit into it, is no longer effective. We have not learned the new story.” See Suzuki, Sacred Balance, 9, quoting Thomas Berry, The Dream of the Earth (San Francisco: Sierra Club Books, 1988); none of the references in the book were paginated. Par. 1, Others have spiritual connections to the sea similar to Rachel Carson: Such feelings were, for example, captured well by an American theologian who spent time in Australia and analyzed the deep connections to marine ecosystems felt by so many in that country. She reflected as well on why Carson well expresses what she considers to be a typical Australian perception. In her story, Carson describes her relation to the wild waves and wet darkness as sea love. All her scientific knowledge and environmental activism was first and foremost based on this sense of wonder and love for seascape. Victorin-Vangerud also described the findings of survey research that found when Australians were asked “about where they most often experience a sense of peace and well-being, 71% of the respondents replied, ‘by the sea.’" See Peter Bentley and Philip J. Hughes, Australian Land the Christian Faith: Facts and Figures (Melbourne, Australia: Christian Research Association, 1998), 108. Other answers that signal nature spirituality, she reported further from this study, were “‘in the bush’ (66%) and . . . ‘in a garden’ (56%).” She concluded, “For some persons the bush, sea and gardens take the place of churches. But for others, the spiritual resources of the natural environment exist alongside traditional religious resources” (no pagination). Schweitzer rejected anthropocentrism and promoted biocentric ethics before the term was invented and was clearly one of the 20th century’s greatest proponents of the themes common in dark green religion. Par. 2, Rachel Carson’s spirituality and ethics have drawn increasing attention, beginning in the 1990s: This has included a documentary, PBS/American Experience, "Rachel Carson's Silent Spring," (1993), and an important book publishing candid, previously unknown writings; see Rachel Carson, ed., Lost Woods: The Discovered Writings of Rachael Carson, The Concord Library (Boston: Beacon Press, 1998). There have been also been valuable Carson-focused articles and books, including Philip Cafaro, "Rachel Carson's Environmental Ethics," Worldviews: Environment, Culture, Religion 6, no. 1 (2002), Finis Dunaway, "The Ecological Sublime," Raritan 25, no. 2 (2005), and Lisa H. Sideris and Kathleen Dean Moore, Rachel Carson: Legacy and Challenge (Albany, New York: State University of New York Press., 2008). See also the biography by Linda Lear, Witness for Nature (New York: Henry Holt, 1997) or for a short nature-religion focused entry, Mary A. McCay, "Carson, Rachael," in Encyclopedia of Religion and Nature, ed. Bron Taylor (London & New York: Thoemmes Continuum, 2005). That Carson’s spirituality was first and foremost related to the sea explains why she initially became a marine biologist. Par. 2, ecofeminist writings using this term did not begin until the mid 1970s, see Françoise d Eaubonne, Le Féminisme Ou La Mort (Paris,: P. Horay, 1974) (who coined the term in this article), Dorothy Dinnerstein, The Mermaid and the Minotaur: Sexual Arrangements and the Human Malaise (New York: Harper and Row, 1976), Susan Griffin, Women and Nature: The Roaring inside Her (San Francisco: Harper and Row, 1978), Rosemary Reuther, New Woman/New Earth: Sexist Ideologies and Human Liberation (New York: Seabury, 1975), Merlin Stone, When God Was a Woman (New York City: Harcourt, Brace, Jovonovich, 1976). For a primer see Laura Hobgood-Oster, "Ecofeminism--Historic and International Evolution," inEncyclopedia of Religion and Nature. Par. 5, more on Suzuki and ecopsychology see his quotes of the poet Anita Barrows (an associate of Joanna Macy) for this critique of Western dualism (179), and report that “Delegates at a 1990 psychology conference at Harvard concluded that a change in direction requires a great awareness of the nature connection: ‘If the self is expanded to include the natural world, behavior leading to destruction of this world will be experienced as self-destruction.’” (180). Suzuki also cited the ethnobiologist Gary Paul Nabhan from an ecopsychology newsletter; Nabhan also co-wrote a book in the eco-psychology genre, see Gary Paul Nabhan and Stephen Trimble, The Geography of Childhood: Why Children Need Wild Places, The Concord Library (Boston: Beacon Press, 1994). For a primer on ecopsychology see Andy Fisher, "Ecopsychology," inEncyclopedia of Religion and Nature, and for an extended analysis, Andy Fisher, Radical Ecopsychology: Psychology in the Service of Life (Albany, New York: State University of New York Press, 2002). 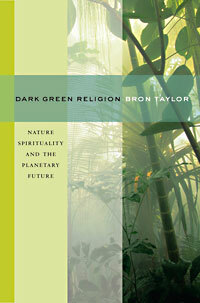 For Macy’s constructive role in ecopsychology and deep ecology ritualizing, see Dark Green Religion, 17-21, 76-77. Suzuki also quoted Paul Shepard, Nature and Madness(San Francisco: Sierra Club Books, 1982), following this with additional lines ones from Vine Deloria Jr. and Chellis Glendenning (182). The above views and those in the corresponding paragraph in Dark Green Religion, in this paragraph are reminiscent of others engaged in dark green religion, including Thoreau who was once effusive about merging with nature after death, Robinson’s Jeffers’ who relished the idea of becoming a vulture, Edward Abbey’s similar desire and plans to be buried without embalmer’s artifice in the desert, and Bill Roger’s suicide note as well. For Jeffers’ and Abbey’s attitudes toward life and death see Bron Taylor, "Death and Afterlife in Jeffers and Abbey," in the Encyclopedia of Religion and Nature. Par. 2, Other scholars who have theorized about the apparent human affinity for various landscapes, include the geographer Yi-Fu Tuan, Topophilia: A Study of Environmental Perception, Attitudes, and Values (Englewood Cliffs, NJ: Prentice-Hall, 1974), Yi-Fu Tuan, "Geopiety: A Theme in Man's Attachment to Nature and to Place," in Geographies of the Mind, ed. David Lowenthal and Martyn J. Bowden (New York: Oxford University Press, 1976), Yi-fu Tuan, Passing Strange and Wonderful: Aesthetics, Nature, and Culture (Washington, D.C.: Island Press/Shearwater Books., 1993). The term geopiety was coined in John Kirtland Wright, Human Nature in Geography: Fourteen Papers, 1925-1965 (Cambridge,: Harvard University Press, 1966), who according to Ian Marshall defined it as "pious emotion evoked by the wonder and the terror of the earth in all its diversity." Ian Marshall, Story Line: Exploring the Literature of the Appalachian Trail (Charlottesville: University Press of Virgina, 1998), 16. Marshall stated that Wright’s examples had little do with his definition, however, as they dealt with those who praise the creator for the creation rather than felt piety toward the earth itself (16-18). Par. 1, note 69, My thanks to Jonathan Benthall for pointing me to David Webster Lee’s, Nature's Palette: The Science of Plant Color (Chicago: University of Chicago Press, 2007). Par. 4, more background and sources on ethnobiology and traditional ecological knowledge: The Harvard anthropologist Richard Schultes (1915-2001) is widely considered the founder of ethnobotany. He studied the medicinal and religious use of plants in indigenous cultures for decades in South America and concluded that the religion-related ecological knowledge of indigenous people was a precious treasury for humankind and that it was critically important to the conservation of biodiversity; his publications are numerous but a good entry point into his work can be found in Richard Evans Schultes, "Reasons for Ethnobotanical Conservation," in Traditional Ecological Knowledge: A Collection of Essays, ed. R. E. Johannes (Geneva: International Union for the Conservation of Nature, 1989), Richard Evans Schultes and Siri Reis, eds.,Ethnobotany: Evolution of a Discipline (Portland, Oregon: Timber Press, 1995). One of his students produced a best selling book that is also a good introduction to this field, see Mark Plotkin, Tales of a Shaman's Apprentice (New York: Viking, 1993). Equally prominent was Roy Rappaport (1926-97), who with Marvin Harris (1927-2001) kindled the field known as ecological anthropology, which is also closely related to and often draws on ethnobiology. For Rappaport’s key works see especially Roy A. Rappaport, Ecology, Meaning and Religion (Richmond, California: North Atlantic, 1979), Roy A. Rappaport, Pigs for the Ancestors: Ritual in the Ecology of a New Guinea People (New Haven: Yale University Press, 1968), Roy A. Rappaport,Ritual and Religion in the Making of Humanity (Cambridge, MA: Cambridge University Press, 1999), Roy A. Rappaport, "Ritual Regulation of Environmental Relations among a New Guinea People," Ethnology 6 (1967), and for a valuable book involving his many students, see Ellen Messer and Michael Lambek, eds., Ecology and the Sacred: Engaging the Anthropology of Roy A. Rappaport (Ann Arbor: University of Michigan Press, 2001); for Harris see Marvin Harris, Cannibals and Kings: The Origins of Cultures (New York: Random House, 1977), Marvin Harris, "The Cultural Ecology of India's Sacred Cattle," Current Anthropology 7 (1966). One of Rappaport’s most important quotes is “Religious rituals [are] neither more or less than part of the behavioral repertoire employed by an aggregate of organisms in adjusting to its environment,” seeEcology, Meaning, and Religion, 28. Rapport’s last work is especially remarkable for its argument that nature-venerating religious ritual is essential for the well being of human and non-human life, alike; and it is an especially illuminating example of the way some anthropologists contribute to and promote dark green religion. Indeed, one anthropologist, Jonathan Benthall, suggests that many anthropology-grounded disciplines (including archeology and cultural anthropology) have “parareligious” or “religioid” (in other words quasi-religious) dimensions. See Benthall,Return to Religion, especially Chapter 6, 147-67. Benthall makes a similar argument about Animal Liberation/welfare and environmental movements, see esp. Chapter 5, 109-39. His analysis provides additional data for the argument of the breadth and diversity of dark green religion and that scholarship has and continues to play a significant role in precipitating and reinforcing it. Other important works from those who can be called ecological anthropologists or ethnobiologists include William Balée,Footprints of the Forest: Ka'apor Ethnobotany; the Historical Ecology of Plant Utilization by an Amazonian People (New York: Columbia University Press, 1994), Darrell A. Posey and William Balée, eds., Resource Management in Amazonia: Indigenous and Folk Strategies (New York: New York Botanical Gardens, 1989), Darrell Addison Posey, Cultural and Spiritual Values of Biodiversity (Nairobi, Kenya: United Nations Environmental Programme, 1999), and for excellent primers see Fikret Berkes, "Traditional Ecological Knowledge," Merideth Dudley and William L. Balée, "Ethnobotany," Gustavo Benavides, "Ecology and Religion," all in the Encyclopedia of Religion and Nature. Many of the above theorists have grounded their understanding of nature religion in evolutionary theory, wrestling with whether religious life can be seen as an evolutionary adaptation that promotes human survival. For further analysis of anthropologist engagements with (and sometimes promotion of) nature religion, see Bron Taylor, "Ecology and Nature Religions," in Encyclopedia of Religion, ed. Lindsay Jones (New York: MacMillian, 2005), Bron Taylor, “Introduction” in Encyclopedia of Religion and Nature, and for further examples, Leslie Sponsel, "Spiritual Ecology: One Anthropologist's Reflections," Journal for the Study of Religion, Nature and Culture 1, no. 3 (2005), and for a controversial article that seems to promote overtly anthropological nature religion, see Leslie E. Sponsel, "Do Anthropologists Need Religion, and Vice Versa? Adventures and Dangers in Spiritual Ecology," in New Directions in Anthropology and Environment, ed. Carole Crumley (Walnut Creek/New York/Oxford: AltaMira Press, 2001). Par. 2, other sources of Berkes’ sacred ecology can be seen in his concluding paragraphs (182-83), which reveal his affinities with other individuals and movements who are influential within the dark green religious milieu, including C.S. Holling (and others involved in “adaptive management” science and practice), Gregory Bateson, Fritof Capra, Aldo Leopold, Yi Fu Tuan (and other topophilia enthusiasts), E.O. Wilson (and biophilia devotees), Arne Naess (and deep ecology supporters), and James Lovelock (and Gaia theory enthusiasts).